Andy Roddick will play his last US Open this year. It’s official, the 2003 and former world #1 Andy Roddick has announced that he will be retiring from professional tennis after the 2012 US Open. The American called a press conference on his 30th birthday, which I thought for sure that he was going to be reciving a birthday cake, instead he makes this shocking announcement. This is really the saddest news I’ve heard all week. Yeah, Clijsters retired yesterday but she announced that earlier in the year. This was totally shocking, Roddick is retiring from tennis. I can’t get over it. I want to cry and wake up from this nightmare. Roddick has always been a staple to tennis, that booming serve, the attitude, just all of him. It’s really hard for me to deal with this information. Roddick reitres from tennis…I knew it was going to come but so soon? I wasn’t ready, your fans weren’t ready. Tennis wasn’t ready! 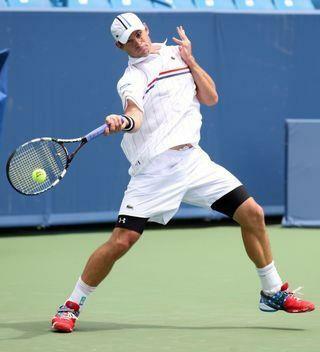 Andy Roddick will play his next match against Bernard Tomic, could this be his last match? I sure hope not, since this is his last US Open, I hope that he goes the distance. Here’s to Andy Roddick, may your retirement be fruitful!